"I sometimes substitute grapefruit juice for the pineapple juice and/or vodka for the rum. Try every combination 'till the sun rises!" Fill a highball glass with ice, and pour in the pineapple juice, rum, vanilla schnapps, and triple sec. 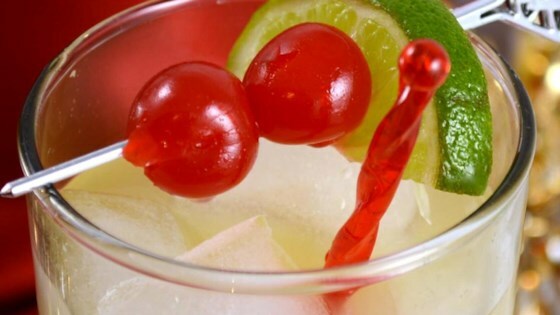 Stir to mix, and garnish with lime and maraschino cherries to serve. Very good. I used vanilla vodka because that was all I had and squeezed the juice from the lime wedge into my drink. Took the edge off. This is a large drink that is pretty potent. You can barely taste the alcohol. All I can say is if you can make it 'til dawn without passing out, you're doing good! This is absolutely wonderful. A nice, clean refreshing flavor. Great balance, and use of all ingredients.